Megan Marlatt has spent the majority of her life on the 38th parallel near Interstate 64; growing up in Louisville, Kentucky and living in Virginia for the past twenty-five years. In her formative years as a young artist, she spent a lot of time studying the paintings of Pierre Bonnard, Balthus, Domenico Gnoli and Eric Fischl. She received her B.F.A. from the Memphis College of Art in 1981, where she acquired a good understanding of the Southern narrative. During the summer of 1985, she studied at the Skowhegan School of Painting and Sculpture in Maine. At Skowhegan, Marlatt learned the art of fresco painting which was to inform her mural work for years to come and studied with Betye Saar, Mary Heilmann and Louisa Chase. She received her M.F.A. at The Mason Gross School of Arts, Rutgers University, NJ in 1986, studying under Leon Golub, Stephen Westfall, Emma Amos and Joan Semmel. She has been a professor at the University of Virginia in Charlottesville since 1988. Marlatt was one of the last individual artists to receive a Fellowship in Painting from the National Endowment for the Arts (1995) before congress denied its access to independent artists. In addition, she has received other individual artist grants from the Virginia Museum of Fine Arts (2013 and 2006), the Virginia Commission on the Arts (1996), and The New Jersey State Council on the Arts (1985). She has had solo exhibitions at the Visual Arts Center in Richmond, VA (2013), the Anthony Giordano Gallery of Dowling College in Long Island (2005), the Dupree Gallery in Philadelphia (2005), Art Nurnberg 8 Festival of the Arts, Germany (1993) and the District of Columbia Arts Center, Washington, DC (1992). Her group exhibitions include Inner Child; Good and Evil in the Garden of Memories at the Hunterdon Museum of Art, NJ, (2006), Fresco/Fresh at the Educational Alliance Art Gallery, NY (2001), New Paintings Curated by Sam Messer at The Painting Center, NY (2000), A New Naturalism at Snyder Fine Art, NY (1997), and Fresco, A Contemporary Perspective at Snug Harbor Cultural Center and Parson's School of Design, NY (both 1993). Marlatt's public art works have encompassed a monumental digital banner for the City of Rockville, MD (2008), a fresco mural completed for Emmanuel Episcopal Church, Rapidan, VA (1996); and site-specific works for Hillwood Museum, NY (1993) and Atlanta Arts Festival, Georgia (1991). 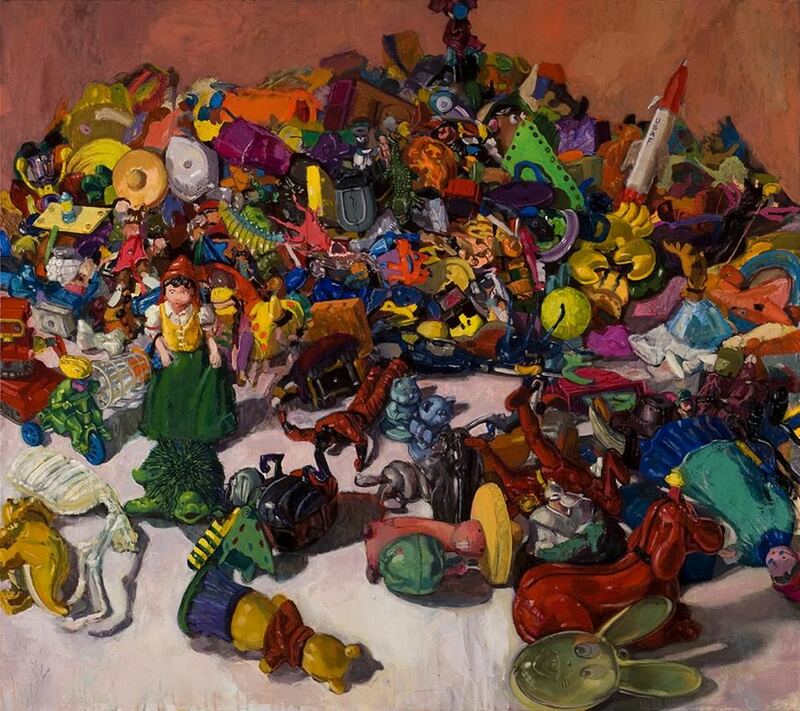 Her painting “LeRoi’s Toys” can be found in the book “The Figure: Painting, Drawing and Sculpture” edited by Margaret McCann. Other publications concerning Marlatt’s paintings of plastic toy motifs have been included in articles in The New York Times, The New York Daily News and The New Jersey Star Ledger. Her earlier work involving food has appeared in articles in Adbusters and Sculpture magazines. Art Papers, Southern Accents, The Washington Post and Albemarle magazine have also published articles about her art. Marlatt has been an artist in residence at the Brush Creek Arts Foundation in Saratoga, WY, Can Serrat in El Bruc, Spain, the Virginia Center for the Creative Arts in Amherst, Virginia, the Jentel Artist Residency Program in Banner, Wyoming and the Tyrone Guthrie Centre in Monaghan, Ireland.